Towanda District Library is pleased to kick-off our 2019 National Library Week Celebration, “Libraries = Strong Communities,” by hosting a local artisans fair this Saturday, April 6. 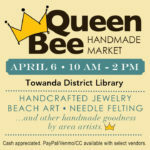 The “Queen Bee Handmade Market” will be open from 10:00 am – 2:00 pm, and the library will remain open until 4:00 pm. Creations by “Uniquely Eclectic” (beaded jewelry), “Sue Necessary Designs” (sea glass framed art, jewelry), “Grace Notes” (modern and traditionally designed jewelry), and “Karafelts” (felt art) will be featured. We invite you to browse their creations—as well as our collection of books, movies, and more!